Elizabeth Moon is a name I’ve heard in science fiction for a long time but I’ve never read one of her novels before. She’s American (and a former marine) and I may have come across her in Asimov’s. I guess the fact that I’ve now read one of her novels is down to the power of having a book, with an eye-catching cover, sitting on the shelf in a book shop. Now I have read one I’m happy to discover she’s written over 20 of them, and I’ll be happy to buy some more. Trading in Danger has a slightly old-fashioned feel to it in that it could have been written 30 or 40 years ago. You’ve got the space ships, space marines and merchants, the needle guns and the ansible that were all staples of the kind of books I was grabbing from the second-hand book shop to feed my rapidly expanding teenage SF habit. No off-putting slide-rules are being used to calculate a ship’s course and there are concessions to the modern age in cerebral implants and advanced medical technology however, that there isn’t much detail about the tech you’ll find in the Hamilton GNR or in my books doesn’t matter at all, because this is about the characters and story. I began to care about the people quite rapidly, thoroughly enjoyed their interactions, and was engaged and dragged along in their story from page one. Highly recommended. 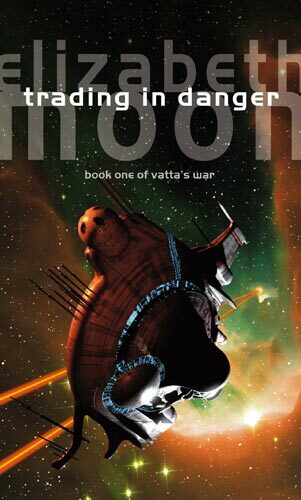 Interesting, Neal, I have read quite a few of Moon's space opera stuff and, whilst I quite liked her Vatta books, I did prefer her Srrano Legacy books. Though they are pretty similar style. Female main character, unfairly disgraced etc.